Panel Glide blinds are an innovative shade solution for any large sliding door or wide window. Versatile and sophisticated, these blinds can also be used as a room divider or decorative panel and are available in varying levels of blockage. Panel Glide blinds are a great solution to any large sliding door. Wide panels of fabric move along the track stacking behind one another using a wand. We install panel glide blinds in residential and commercial properties throughout Newcastle, Maitland and Hunter Valley. 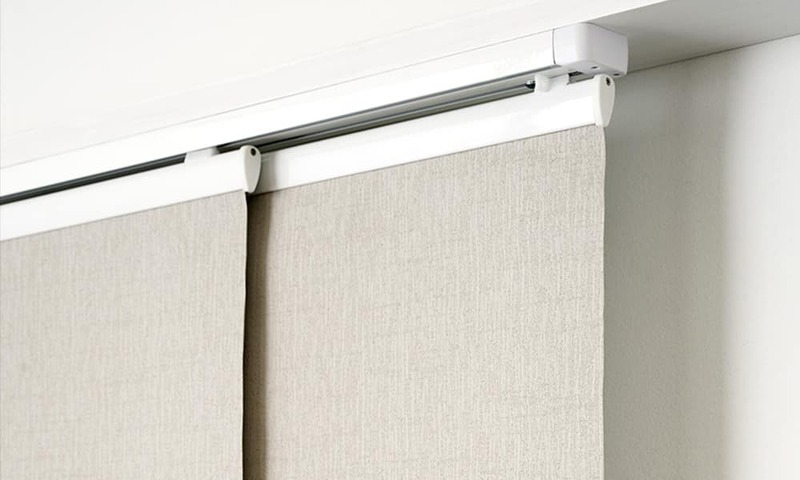 Increase privacy and sun protection with our panel glide blinds, available in a range of fabrics. The blinds glide smoothly, allowing for a practical and stylish solution for your Newcastle home or business. Panel Glide blinds offer a simple mechanism and low maintenance requirements. With a combined experience of 80 years and a highly skilled installation team, we’re the trusted panel glide blind specialists for residents and businesses throughout Newcastle, Maitland and Hunter Valley. View our stylish pane glide blinds from the comfort of your own home with our mobile showroom. Contact us to book a free measure and quote, or visit our showroom at 21/13 Hartley Drive, Thornton NSW 2322.